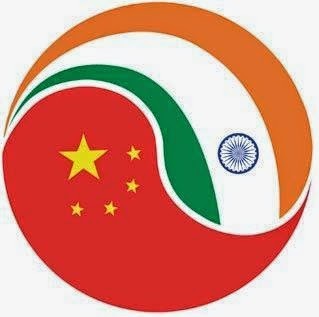 An analysis of China’s reading of the pulse of India’s foreign policy changes under Prime Minister Narendra Modi written on June 13, 2014 titled “China’s reading of India’s foreign policy trend” is reproduced below. Since then Prime Minister Modi has returned home after his maiden foreign visit to Bhutan. Modi’s as a relationship building exercise it may be called a moderately successful visit, considering the extremely short preparatory time the foreign offices of both countries had. However, its impact would be watched with interest by both India and China during the forthcoming border talks between Bhutan and India. A Global Times article on Modi’s visit welcomed the visit. And Chinese foreign ministry spokesperson has announced that India’s Vice President Hamid Ansari would be attending the commemoration ceremony China’s holding at Beijing to celebrate the 60the Anniversary of the Panchsheel next week. Modi's Japanese visit will be taking place in second half of July due to the Budget presentation in parliament on July 11. Obviously, China seems to be taking the Indian move in Bhutan in its stride. In any case it is too early to read the Indian Prime Minister’s mind on foreign policy making. It would be reasonable to do so as its contours emerge in the coming months. The two-day visit of Chinese Foreign Minister Wang Yi as President Xi Jinping’s Special Envoy to New Delhi within three weeks of Prime Minister Narendra Modi assuming office underlines China’s keenness, if not anxiety, in building bridges with the Indian leader who has come to power with a massive personal mandate. In spite of all the flowery rhetoric at play during Wang Yi’s visit, he probably had a limited agenda to feel the pulse of the new Indian leadership under Narendra Modi. This is not going to be an easy exercise because Modi has shown he leads from the front with an assertive style and ruthlessly pursues his objectives. His campaign style and later his utterances in office have shown his uncanny ability to spring surprises upon the opposition and the regional satraps. Prime Minister Modi spending 45 minutes at his meeting with the Chinese visitor despite his heavy schedule in the early days of office is significant. It showed the importance Modi attached to India’s relationship with China and the wide range of issues that probably figured in the meeting. Chinese leadership is likely to be pleased with this as the new Indian government has sent a number of confusing signals on some of China’s key concerns regarding India. On the foreign policy front also the “Modi touch” had its effect; two cases in point were his invitation to the SAARC heads of government to attend his swearing-in function and the announcement that Bhutan would be the destination of his first overseas visit. Bhutan has close strategic relations with India and like India has an ongoing dispute over China’s claims over Bhutanese territory. Some of the actions of the Modi government, even before it completed a month in office, touch upon some of China’s “core interests” as well as strategic security concerns. And they have come close on the heels of the visit of the Special Envoy. These actions give some inkling into the emerging Indian security perspective on China. Territorial integrity: China could not ignore the presence of Lobsang Sangay, the political head of the so-called Tibetan government-in-exile, at the prime minister’s oath taking function. It promptly sent off a demarche to India protesting against the invitation to Sangay, as it considers any public recognition of the Tibetan exile set up as an affront to its territorial integrity. Added to this is Modi’s Facebook entry which said Sangay was “an honourable guest of the Bharatiya Janata Party (BJP)” indicating the possibility of the Tibetan issue gathering mass at a later date. Inviolability of national borders: There were indications that India would be speeding up infrastructure development work along its border with China. These were probably deferred as the Manmohan Singh regime did not want to ruffle China’s sensitivities on this count. a. The Indian Home Ministry has agreed on principle to the setting up of 54 new Indo-Tibetan Border Police (ITBP) border posts along in Arunachal Pradesh with the likely increase in ITBP strength by 50,000 troops. The increase in border posts would help improve India’s security posture in this disputed region. Already raising of an additional mountain strike corps for this region is underway and a number of advanced landing grounds for air support are also being added. In the past, the Chinese have been reacting to any Indian effort to improve the infrastructure in their “claim” territory on the Northern borders of India. b. Close on the heels of the report on ITBP came Indian environment minister Prakash Javadekar’s indication that faster environmental clearances would be given to border roads and strategic defence infrastructure projects in border areas pending with his ministry for long. This would mean the speedier completion of 80 road projects within 100 km from the Line of Actual Control on the Northern border with China. This region has been the scene of a number of violations by Chinese troops who had been objecting to improvement of road communication on the Indian side. Indian Ocean security: The Environment Ministry has also cleared a proposal to install a radar station at Narcondam Island in the Andaman Nicobar Command. This six-year old proposal would help the armed forces to monitor the reported Chinese activity in the Coco Island off Myanmar coast, very close to the Northern Andaman. The Indian Prime Minister plans to visit onJuly 14 the newly acquired aircraft carrier INS Vikramaditya to see its capabilities at sea. These do indicate India’s determination to assert its naval superiority in the Indian Ocean region, where Chinese navy had been progressively increasing its presence. Strategic relations with Japan: At a time when China’s relations with Japan are turning increasingly confrontational, China would be watching the Indian Prime Minister’s planned meeting with Japanese Prime Minister Shinzo Abe on July 3-4 at Tokyo with concern. Modi would be meeting his Japanese counterpart even before he meets with Chinese President Xi Jinping on the sidelines of the BRICS Summit in Brazil later in the month. The significance of Modi’s parley with Abe at a Summit meet unlike the one with the Chinese leader would not be missed by the Chinese. More so as Modi enjoys a personal rapport with his Japanese counterpart which could turn the Summit meet to trigger a few strategic security initiatives. Though the Chinese find these reports difficult to digest as they had been accustomed to browbeat India in the past, Prime Minister Modi has some positives that could help them build a win-win relationship. First is Narendra Modi’s familiarity with China and, probably admiration for, its development model. As Chief Minister of Gujarat, he had visited China three times. All the visits had productive development agendas. He visited China twice in his first tenure as chief minister. The first visit in November 2006 was to study the Special Economic Zones while in September 2007, he led a delegation of Gujarati entrepreneurs to the port city of Dailan, the second largest container transshipment hub in China. Northeast China. The Gujarat development model including the huge infrastructure and special economic zones have benefitted from Chinese experience and expertise can help China in improving its equation with the Indian Prime Minister. His visit to China in 2011 probably secured the unconditional release of 13 diamond merchants of Gujarat who were jailed in Shenzhen for alleged violation of customs norms. Xi Jinping’s message (conveyed by the Special Envoy) to Prime Minister Modi praising his leadership and inviting him to “work together to achieve peaceful cooperation and inclusive development for the benefit of our two people and in the interest of peace, stability and prosperity in Asia and in the world" tries to build upon the existing positives of Modi’s personal equation with China. Its reaffirmation of China's positive perception of India's role in the world and expectation and desire for pursuing bilaterally their development dreams is probably an indication how Xi would like China-India relations to develop. Modi’s warm reciprocation of the Chinese sentiments in his talks with the Special Envoy emphasizing the potential for greater cooperation and to work for mutually beneficial trade and investment as economic partners probably reflects his expectations. The inclusion of plans to energetically engage with China to further develop strategic and cooperative partnership in the Modi government’s agenda presented by President Pranabl Mukherjee’s address to the parliament underlines the importance attached to India’s relationship with China. Modi’s economic development plans presented in the agenda and his top ten priorities to shore up the nation’s economy provide a number of investment and business opportunities for the Chinese. So till the relationship with the Indian government is established on a firm footing, China is likely to focus on these opportunities rather than allowing the negatives to dissipate them. Given the elephantine memory of the Chinese and their penchant for focusing on choosing their initiatives at the tactically advantageous moments, in the near term we may not see dramatic change on their conduct on the border. This is confirmed by Wang Yi’s facile justification of border intrusions in the North as well as the issue of stapled visas at his press conference in New Delhi. However, probably the improvement in personal equation of Prime Minister Modi with Prime Minister Li Keqiang and Xi Jinping in the coming months would determine the speed and destination of India’s relationship with China. To summarise Modi seems to have given sufficient indications to China that while he is holding out the hand in friendship, he also has a mailed fist on the other. Chinese leaders would be factoring it in tailoring their India policy to suit the changed assertive leadership style of the new Indian government.